Yes, Atlanta is covered in snow and that means I'm having dreams of spring! Just last night I was talking with a friend about how beautiful Atlanta is in the spring (while awaiting the impending snow storm)...and the Atlanta Botanical Garden is one of the most beautiful places in the city, especially in the spring. 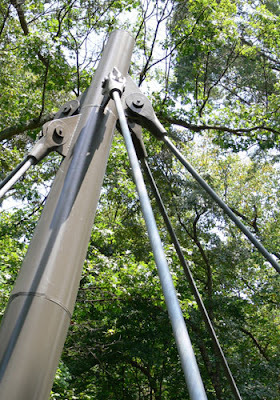 This photo is part of the suspension system that makes up the new Canopy Walk in the Atlanta Botanical Garden. When you drive by on Piedmont Avenue, you get a glimpse of the Canopy Walk but that doesn't compare to the view of the Garden from atop the 600-foot suspension bridge. I also find myself looking forward to "Orchid Daze: Liquid Landscapes"...there are no frozen forms of water that I'm aware of in the exhibit. It opens in a few short weeks on Saturday, February 5, 2011. Thanks for visiting my place and letting me know about St. Phillips glass tour. If all goes well I'll do St. Luke's tour on Thursday. We'll see.